LPe provided Structural engineering services for this 11,000 square foot, one-story chemical feed building which serves as the main facility for water treatment for the City of Shreveport. A mono rail is designed inside the structure to facilitate transport of chlorine tanks. The foundation consists of grade beams and drilled piers. LPe provided Structural engineering services on this 4,000 square foot single-story emergency facility. The steel frame structure is supported by shallow footings. LPe provided Structural engineering services on this three-story structure. The fire hall is an 11,300 square foot single-story structure with slab-on grade. Structural engineering services on a new 30,000 square foot one-story structure which will be used as a municipal and fire station. The structure is supported by shallow foundations. LPe provided Structural engineering services on this new 6,000 square foot one-story structure. The building which is being used as an Emergency facility in Cumberland county is designed for a High Seismic Importance factor. 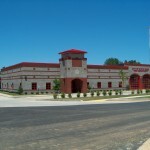 LPe provided Structural engineering services on a new fire station facility for the City of Shreveport, Louisiana. The fire station is a two-story 26,000 square foot composite steel structure supported on deep foundations.